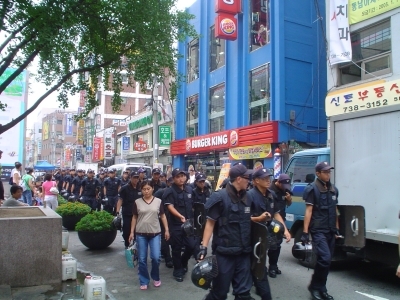 Korean Police arrive in volume as a well organised demonstration arrives nearby. Shoppers pass through these guys as if it were a normal day in town which in fact it is! 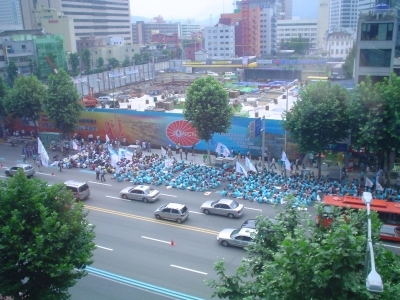 View of the demonstration from Art Center Nabi… all participants wore light blue t-shirts, sang, danced and struck drums from time to time. No idea what they were demonstrating about. Looked like fun. They were significantly out numbered by the Police who were stationed across the road (below me) and around the corner to the left of the building site.